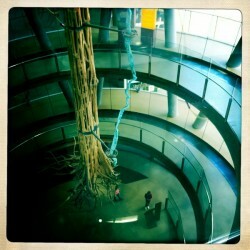 CosmoCaixa Barcelona: Out of this world! Posts were a bit thin on the ground last week. In fact they were non-existent. I had my family here. Six of them. Three adults and three children. All in my flat. And I invited them. I know! So writing a blog post was pretty low down on the list whilst organising showering times was pretty high up. But all joking aside, it was great to have them here. But what to do with them? With ages ranging from 8 to 80 it can prove tricky finding something that they all can enjoy. My mum likes a church – Santa Maria del Mar, the Cathedral of Santa Eulalia, the Sagrada Família and Santa Anna (a tucked away church I will tell you more about another time). We trod them all. And the kids? Well they would spend a whole morning in Happy Pills if they had their way. 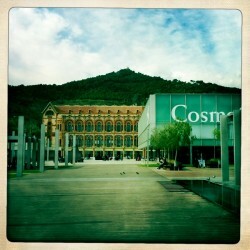 But for anyone with a similar dilemma I highly recommend you go to the CosmoCaixa Barcelona near Tibidabo. 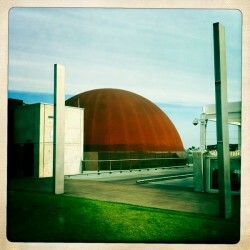 This CosmoCaixa science museum was opened in 2005 and is run by the social foundation “la Caixa”. It is an incredible space that comprises a geological wall, interactive science exhibits, an Amazon rainforest and a planetarium. You enter the museum down a huge spiral walkway that takes you to the 5th floor basement and winds around an old Amazonian tree called an Acariquara. The name of this Amazon tree: Acariquara, means ‘hole of the acari fish’. Perhaps that is because the tasty acari, armoured by its bone plates (acari: armoured), hides amongst the holes in the tree’s trunk when underwater. The wood of these trees, which reach heights of between 25 and 30 metres, is very heavy (it will not float) and resists practically everything. The small, purple fruit of this tree is edible, with an elipsoidal shape, containing latex when green. The knots and holes seem to take their inspiration from one of the towers in Gaudí’s Church of the Sagrada Família in Barcelona. Now I’m a big fan of the Sagrada Família and this is an impressive tree. But surely if there was any ‘inspiration taking’ going on it was Gaudí that took his inspiration from the tree. Not the other way around. Lost in translation maybe. Or just a Catalan thing. Anyway, impressive nonetheless. Once around the inspirational tree you enter the main museum with all the interactive exhibits. 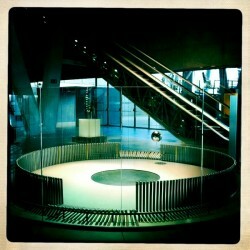 I remember going to the science museum in London when I was a child. And I only do so because of the interactive exhibits. And things haven’t changed a great deal. They are just slightly cooler. Things you can sit on or stand in. Push, swing, spin, turn. And even touch! For the kids this is great. They really don’t care too much about inertia, or gravity, or how the earth spins on it’s axis. You hope a little goes in but it’s just nice to see them having fun. There really are little woahs and ahhhs coming from their mouths. And let me say it was thoroughly interesting for me too. You can start tornados and create sandstorms. All great fun for a big kid. You can easily spend an hour in here. 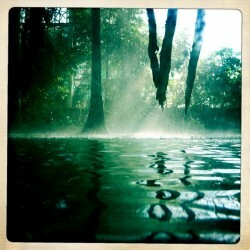 After meandering through the main museum you are confronted with the Flooded Forest (Bosc Inundat). An Amazonian ecosystem recreated in Barcelona. This floor to ceiling greenhouse is very impressive. Through the glass wall at the bottom you can see huge (and I mean huge!) fish swimming around in the flooded forest. And once inside there are exhibits of snakes and other reptiles and insects. The ant farm is very cool. A proper ant colony under the forest floor. You can walk out into the forest itself with 30m trees and birds running in and out of the visitors. And if you’re lucky you may see the largest living rodent in the world, the Capybara, actually awake. He was fast alseep when I was there. And it even rains! Every 15 minutes. Though not on the paths luckily. We didn’t get to the planetarium unfortunately. There were shows at 1pm and 5.30pm but we were too late for the first and too early for the later one. So do check the times and book in advance if this is something you really want to see. The shows are in Spanish but with audio in other languages too. So we went to the cafe instead. And for €14 had an all you can eat buffet. Salads, hot dishes and desserts. Of which I had three. A bargain! The CosmoCaixa in Barcelona is world-renowned and rightly so. It’s a great day out for kids and adults alike. And the permanent exhibits are supplemented by temporary ones throughout the year so check the programme. The CosmoCaixa Barcelona is pretty much open Tue to Sun, 10am-8pm but again, check the website for details throughout the holidays. Adult prices at the time of writing are €3 for the museum and €2 for the planetarium. €2 and €1.50 respectively for children. You can get to the CosmoCaixa by getting the metro to Av. Tibidabo and walking up c/ Cister. Or if you’re feeling lazy you can get on the Tramvia Blau across the street. Great place, has a great view of the city as well. I found this via Wikipedia. It’s definitely going on my to do list! I have a link from Wikipedia! Cool! Enjoy the CosmoCaixa when you go.